Create your own electronics projects in minutes with the Crazy Circuits Set. 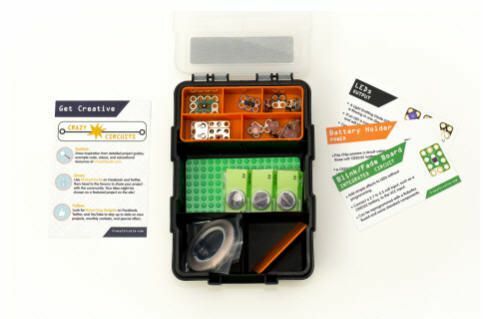 The Starter Set Includes Crazy Circuits Chips; Blink/Fade Board; Slide Switch; Two Coin Cell Battery Holders; Five Jumbo 10 mm LEDs (Red, Amber, Green, Blue, White); Five Mini Surface Mount LEDs (Red, Amber, Green, Blue, White); Piezoelectric Speaker; Conductive Nylon Tape - 1/8 ", 16 feet; Conductive Thread Bobbin - 16 feet; Five CR2032 Batteries; LEGO™ Baseplate (8 x16 studs); Plastic Organizer. The Deluxe Set includes Crazy Circuits Chips; Touch Board and USB Cable; Blink/Fade Board; Three Standard Pushbuttons; Three Jumbo Pushbuttons; Two Slide Switches; Three Coin Cell Battery Holders; Ten Jumbo 10mm LEDs (Red, Amber, Green, Blue, White); Five Mini Surface Mount LEDs (Red, Amber, Green, Blue, White); Five Brick LEDs (Red, Amber, Green, Blue, White); Mini RGB LED; Piezoelectric Speaker; Two Screw Terminals; Conductive Nylon Tape - 1/8 ", 16 feet; Conductive Thread Bobbin - 16 feet; Five CR2032 Batteries; 2AAA Battery Holder; LEGO™ Baseplate (8 x16 studs); and Plastic Organizer. The Makerspace Set includes Crazy Circuits Chips; Five Touch Boards and USB Cables; Three Robotics Boards and USB Cables; Five Blink/Fade Boards; Five Standard Pushbuttons; Five Jumbo Pushbuttons; Five Slide Switches; Five Coin Cell Battery Holders; Twenty Jumbo 10 mm LEDs (Red, Amber, Green, Blue, White); Twenty Mini Surface Mount LEDs (Red, Amber, Green, Blue, White); Fifteen Brick LEDs (Red, Amber, Green, Blue, White); Five Mini RGB LEDs; Five Piezoelectric Speakers; Ten Screw Terminals; Ten Rolls of Conductive Nylon Tape - 1/8", 16 feet; Five Bobbins of Conductive Thread - 16 feet; Ten Alligator Clips; Fifty CR2032 Batteries; Five 2AAA Battery Holders; Three Standard Servo Motors; Six Continuous Rotation Servo Motors; Ten LEGO™ Compatible Servo Brackets; Ten LEGO™ Compatible Servo Horns; Ten LEGO™ Baseplates (8 x16 studs); and Plastic Organizer.